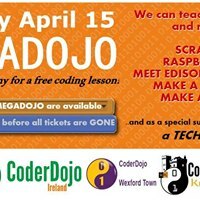 On Sunday 15th April, 4 Dojos - Coderdojo Kilkenny, Wexford, Tramore & Waterford - are collaborating for the very first time in running Megadojo SouthEast. 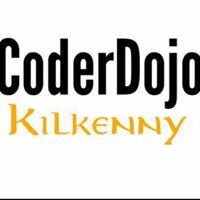 Coderodojo Kilkenny is hosting the event here in The Newpark Hotel, Kilkenny on April 15th. We are inviting young people to a Taster session of coding. 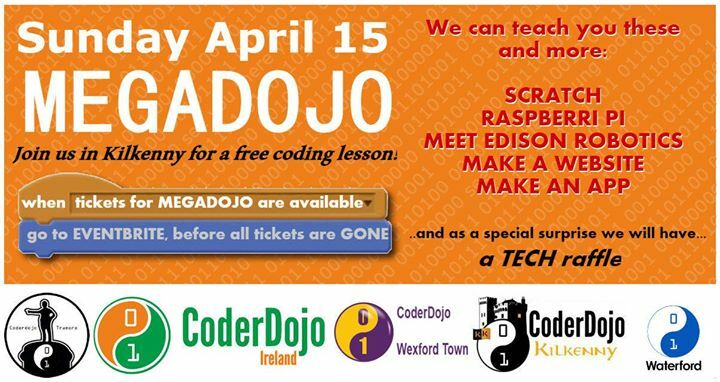 A MegaDojo is a large scale CoderDojo event that brings together young people from several Dojos as well as those who’ve never attended a Dojo before. Children under 13 need to be accompanied by a parent/guardian on the day. The event will run from 10am to 4:00pm made up of 3 separate consecutive 1.5hr sessions. Throughout the day, we’ll be running coding Workshops covering topics such as Scratch, Web Development, Meet Edison, Python and SPFX. We have workshops that are suitable for complete beginners to advanced coders. We have some hands-on tech-based activities, coding workshops, and demos from companies (ranging from multinationals to locally based start-ups). Raffle tickets will be on sale (€5 each) for A Tech Hamper Raffle - prize includes a drawing pad, a bouncy castle voucher and a Meet Edison robot.